Objective To investigate the prevalence of financial interests among patient organisations contributing to health technology assessment at the National Institute for Health and Care Excellence (NICE) in England and the extent to which NICE’s disclosure policy ensures that decision making committees are aware of these interests. Design Policy review using accounts, annual reports, and websites of patient organisations; payments declared by pharmaceutical manufacturers on their websites and a centralised database (Disclosure UK); declarations of interests by nominated representatives of patient organisations; and responses from patient organisations. Setting Appraisals of medicines and treatments (technologies) for use in the English and Welsh National Health Service. Participants 53 patient organisations contributing to 41 NICE technology appraisals published in 2015 and 2016, with 117 separate occasions that a patient organisation contributed to the appraisal of a technology. Results 38/53 (72%) patient organisations had accepted funding from the manufacturer(s) of a technology or a competitor product in the same year that they had contributed to the appraisal of that technology or the previous year. Specific interests were present on 92/117 (79%) occasions that patient organisations contributed to appraisals in 2015 and 2016. NICE’s decision making committees were aware of less than a quarter of specific interests (30/144; 21%). For nearly two thirds of the specific interests not known to committees (71/114; 62%), disclosure by patient organisations was not required by NICE’s policy. Conclusions Financial interests are highly prevalent among patient organisations contributing to health technology assessment. NICE should review its disclosure policy to ensure that decision making committees are aware of all relevant interests. An important area of advocacy for patient organisations is that of decisions on public coverage of medicines and treatments, often undertaken by health technology assessment (HTA) agencies. HTA agencies are increasingly seeking to involve patients in their decision making processes, with participation now standard in agencies across North America, Europe, Asia, and Australasia.91011121314 Incorporating patient perspectives into HTA provides unique information about the impact of the condition or treatment that may not be available elsewhere, leading to more informed, responsive, and legitimate decisions.1516 HTA agencies often work with patient organisations to recruit or represent patients, and surveys consistently show that HTA agencies most commonly engage with patient organisations rather than with individual patients or members of the public.101112131718 At the National Institute for Health and Care Excellence (NICE) in England, patient organisations are most routinely involved in the programme for assessing new and existing medicines and treatments known as technology appraisal. The English and Welsh National Health Services (NHS) are legally obliged to provide any technologies recommended by NICE’s technology appraisal.19 To date, NICE has asked patient organisations to declare potential interests only if an organisation’s representative is nominated to give evidence to a decision making committee.20 In this case, representatives should consider declaring any funding received by their organisation from the manufacturer of the technology under appraisal or a competitor product as an indirect specific interest. To review the effectiveness of this policy, we investigated the prevalence of interests—both declared and undeclared—among patient organisations contributing to the technology appraisal programme at NICE. We collated a list of patient organisations contributing to technology appraisal guidance over two years of the programme. To do this, we used a publicly available list of NICE’s decisions (https://www.nice.org.uk/about/what-we-do/our-programmes/nice-guidance/nice-technology-appraisal-guidance/summary-of-decisions) to identify all technology appraisals published between 1 January 2015 and 31 December 2016 (n=97).21 Technology appraisals can be discussed by the decision making committee at several meetings during the development process, with most evidence presented at the initial discussion. We therefore excluded any technology appraisal that had its initial discussion at a meeting earlier than 2015. 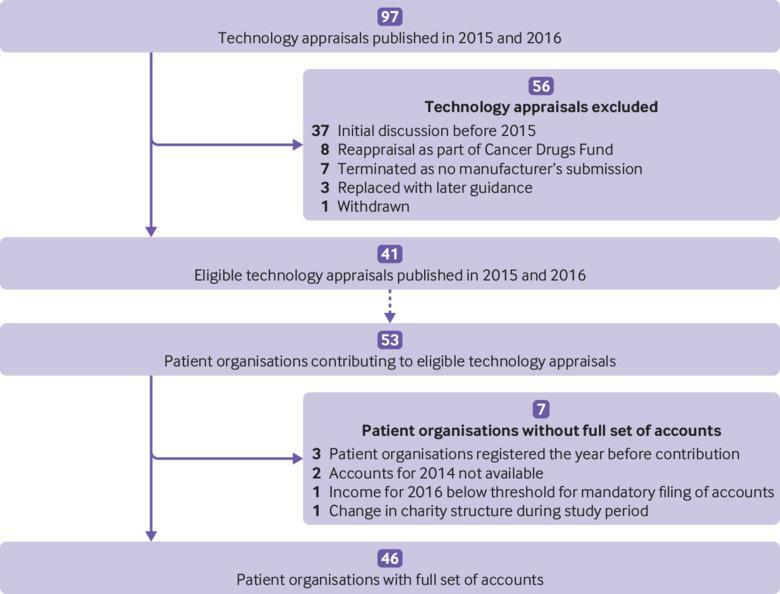 We also excluded any technology appraisals that were reappraisals of technologies as part of the Cancer Drugs Fund,22 as well as any that were subsequently withdrawn, terminated, or replaced with later guidance (see figure 1). Two authors (KM and HP) reviewed the documents for each technology appraisal publicly available on the NICE website (www.nice.org.uk) to identify any patient organisations that had contributed to that technology appraisal. Five main types of contributions exist (https://www.nice.org.uk/about/what-we-do/our-programmes/nice-guidance/nice-technology-appraisal-guidance): commenting on the draft scope, which defines the patient population, comparator technologies, and outcomes covered by the appraisal; submitting written evidence to the decision making committee that will be considered alongside clinical and economic evidence; nominating a patient expert to provide written and oral evidence to the committee; nominating a clinical expert to provide written and oral evidence to the committee; and responding to consultations on draft guidance (usually held only when NICE is minded not to recommend a technolgy). Contributing patient organisations may also appeal the final recommendation made by NICE. Technology appraisals may assess multiple drugs or treatments at the same time. We therefore counted each occasion that a patient organisation contributed to a technology in a technology appraisal as a separate event. For each occasion, we noted the manufacturer of the technology under appraisal, as well as manufacturer(s) of any competitor products as designated by NICE in the publicly available matrix document for each technology appraisal. We then assessed whether patient organisations contributing to the technology appraisal programme had declared any interests. All people attending committee meetings on behalf of an organisation are asked to declare any interests that might directly benefit them as individuals, as well as any relevant interests held by their organisation as indirect interests.20 For technology appraisals, patient experts are ideally people who have the condition and, where possible, have used the medicine or treatment under appraisal. Patient organisations may identify such people from their volunteers or beneficiary networks. However, patient experts are often employees, medical directors, or trustees of a patient organisation, with expertise on a condition gathered from their personal or professional experience. We restricted our analysis to these individuals, as other patient experts may not have considered that they were representing an organisation. Declarations of interests should occur at two points: a written declaration as part of a standard nomination form filled in by all experts, which may influence their selection for committee meetings; and an oral declaration made by all experts at the start of any committee meetings. To investigate the first of these, we requested nomination forms held by NICE for all patient experts nominated for the eligible technology appraisal (see supplementary file for version of nomination form used during study period). One author with access to NICE’s internal records (HP) reviewed all available forms, noting whether the patient expert was an employee, trustee, or medical director of the nominating patient organisation and whether any indirect specific interests were declared (funding received by the organisation from the manufacturer(s) of the technology under appraisal or competitor products). To investigate oral declarations, two authors (KM and CS) reviewed minutes of the first committee meeting at which each technology appraisal was discussed, noting the same aspets as above. All minutes are publicly available on the NICE website (https://www.nice.org.uk/Get-Involved/Meetings-in-public/Technology-Appraisal-Committee). Any differences or ambiguous cases were discussed between authors until resolution. We then searched for declared pharmaceutical industry funding in relevant years. This was the year in which a patient organisation had contributed to a technology appraisal (that is, 2015 or 2016) and the previous year (2014 or 2015). This time period is in line with NICE’s policy, which requires an initial declaration of interests to cover the preceding 12 month period.20 We searched the Association of British Pharmaceutical Industry (ABPI)’s Disclosure UK database (http://www.abpi.org.uk/ethics/ethical-responsibility/disclosure-uk). The ​ABPI’s Code of Practice requires pharmaceutical manufacturers to disclose any financial support to healthcare professionals and organisations (including patient organisations), with data from 2015 available on the database.23 Two authors (KM and HP) searched the database for payments to all identified patient organisations in 2015 and 2016, extracting the year, amount, and manufacturer. We included payments to employees, medical directors, or trustees of that organisation and all payments listed under the organisation’s name even if the listed address was different from the registered office. We excluded payments if the organisation’s name indicated a different jurisdiction (for example, [patient organisation name] Northern Ireland) and this was a charity separately registered with the appropriate charity regulator (see below). Results were compared between authors, with discussion to resolve any discrepancies. As Disclosure UK is not yet comprehensive (http://www.abpi.org.uk/ethics/ethical-responsibility/disclosure-uk/explore-the-data-further/), we also searched the websites of all relevant manufacturers for disclosures of payments to patient organisations in 2014, 2015, and 2016. We converted currencies into pounds sterling where necessary, using historical exchange rates from xe.com for 1 January 2014, 2015, and 2016. Following the approach of McCoy et al, two authors (CS and AP) also reviewed the annual accounts (and accompanying annual reports where available) of patient organisations in relevant years to identify pharmaceutical industry funding.2 If accounts were not available on the organisation’s website, we searched the website of the appropriate charity regulator—that is, the Charity Commission for England and Wales (https://www.gov.uk/government/organisations/charity-commission) or the Scottish Charity Regulator (https://www.oscr.org.uk). Charities in the UK can have different financial years, so we defined 2014 accounts as having a financial year ending between 1 July 2014 and 30 June 2015, 2015 accounts between 1 July 2015 and 30 June 2016, and 2016 accounts between 1 July 2016 and 30 June 2017. We noted any reported funding from the pharmaceutical industry, including amount and manufacturer, and calculated the proportion of total funding that this represented for the organisation. Accounting standards for UK charities recommend recording substantial in-kind contributions (for example, providing catering for an event or printing promotional materials) with their approximate value. Another author (KM) reviewed the extracted data and compared any discrepancies with the primary data sources. Two authors (RB and CS) also searched the websites of all patient organisations for any mention of pharmaceutical industry funding, including likely in-kind contributions (such as “we thank X for supporting our event”). We noted the manufacturer, amount, and year of donation where available. We also searched for any policies related to pharmaceutical industry funding. Discrepancies or lack of detail in these data sources prompted us to follow the approach of Perehudoff and Alves by contacting all patient organisations by email or website enquiry form as a final step.5 This allowed us to validate the findings from the previous steps, as well as to consult patient organisations on our proposed recommendations. We sent one reminder email after one week. We pooled evidence of pharmaceutical industry funding from annual accounts/reports, websites, manufacturers’ disclosures, declarations of interests, and responses from patient organisations. We took the highest amount of funding from each manufacturer declared across all data sources to calculate total funding. For each patient organisation, we then noted whether it had accepted funding from the manufacturer(s) of a technology or competitor product(s) in the same year that it had contributed to the appraisal of that technology or the previous year, which NICE would consider a specific interest. As patient organisations can contribute to several technology appraisals, we did the same for each occasion that an organisation had contributed to a technology appraisal. If a specific interest was identified, we noted whether the NICE committee was aware of this interest through either written or oral declaration by the representative of the patient organisation. For the three occasions in which both nomination form (written declaration) and meeting minutes (oral declaration) were missing, we assumed that committees were aware of any interests. For specific interests of which committees were unaware, we noted whether this was because disclosure had not been required by NICE’s policy (that is, contributions from patient organisations other than nomination of experts). To examine whether specific interests of unknown to NICE’s committees had an effect on decisions, we did a logistic regression of NICE’s decision for each technology (that is, recommended or not recommended for use in the NHS) against the presence of unknown specific interests. The results were inconclusive, but power was low, so we omitted the analysis from this report. The Public Involvement Programme, which supports involvement of patients, carers, and the public in NICE’s activities, advised on the design and conduct of this study. We also consulted with patient organisations about our proposed recommendations, and we plan to disseminate our findings to these organisations by email after publication. Individual patients and members of the public were not directly involved in the conduct of this study. NICE published 97 technology appraisals in 2015 and 2016. We included 41 of these in the analysis (see figure 1 for reasons for exclusion). All but two technology appraisals received contributions from at least one patient organisation, with 53 different organisations identified (fig 1). Twenty three (43%) of these contributed to multiple technology appraisals over the two years (range one to six), with 117 occasions in total when a patient organisation had contributed to a technology appraisal. In terms of type of contribution, patient organisations most frequently submitted evidence and nominated patient experts (table 1). Two thirds (52/76; 68%) of patient experts nominated by patient organisations were employees (including chief executives), trustees, or medical directors of that organisation. Table 2 summarises evidence of pharmaceutical industry funding from patient organisations’ annual accounts/reports, websites, Disclosure UK, individual manufacturers’ disclosures, declarations of interests, and patient organisations’ responses. The income of patient organisations ranged from less than £20 000 (€22 000; $25 000) to more than £119 million between 2014 and 2016. The percentage of income from pharmaceutical industry funding ranged from less than 1% to one organisation deriving nearly 70% of its income from three manufacturers. Wide discrepancy existed between these data sources, including amounts of funding and named manufacturer(s). Individual manufacturers’ disclosures provided the most complete picture, despite being available for only just over a third of manufacturers (31/87; 36%). Less than half of manufacturers in this study (42/87; 48%) submitted data to Disclosure UK in 2015 and 2016, limiting its usefulness. Along with lack of completeness, the database seems to have no unique identifier for patient organisations (such as registered charity number) and payments were often not consistent with those declared on manufacturers’ websites. Inconsistency between written and oral declarations was present on 22/36 (61%) occasions. Contacting patient organisations resolved discrepancies between data sources in only a fifth of cases, with 11 (21%) organisations able to clarify manufacturers’ funding. Seventeen (32%) organisations replied but did not want to provide data, and 27 (51%) did not respond. When we pooled all the evidence, more than two thirds (38/53; 72%) of patient organisations held specific interests (that is, funding from the manufacturer(s) of a technology or a competitor product in the same year as the organisation contributed to that technology’s appraisal or the previous year) (table 3). As patient organisations often contributed to multiple technology appraisals, we also examined evidence of pharmaceutical industry funding for each occasion that a patient organisation contributed to technology appraisals. Specific interests were present in almost four out of five (92/117; 79%) occasions that patient organisations contributed to technology appraisals in 2015 and 2016. After review of written and oral declarations of interests, we found that NICE’s decision making committees were aware of less than half (30/73; 41%) of all declarable specific interests (table 3). For nearly two thirds (71/114; 62%) of the specific interests unknown to committees, declaration was not required by NICE’s disclosure policy (that is, contributions from patient organisations other than nomination of representatives as patient experts). Overall, NICE committees were aware of less than a quarter (30/114, 21%) of all specific interests identified (both declarable and non-declarable under current policy). Nearly all representatives who declared specific interests on behalf of their organisation at nomination stage were invited to attend the first committee meeting, with no difference between the proportions of those declaring interests and attending and those declaring no interests and attending (20/21 v 23/25; Fisher’s exact P=1). All representatives who declared specific interests on behalf of their organisation at the start of committee meetings were allowed to remain in the meeting and provide oral evidence. We identified policies on pharmaceutical industry funding for nearly a third (16/53; 30%) of patient organisations, with two organisations not accepting any funding from manufacturers. Twelve organisations committed to disclosing any funding in annual reports or websites, 11 placed conditions on funding such as a cap on the percentage of income received from industry or from one manufacturer, and three organisations had specific clauses for policy and HTA activities. Virtually all NICE’s appraisals of medicines and treatments for use in the NHS in 2015 and 2016 received contributions from patient organisations, with many such organisations contributing to multiple appraisals. More than two thirds of patient organisations had accepted funding from the manufacturer(s) of a technology or a competitor product(s) in the same year that that they had contributed to the appraisal of that technology or in the previous year. NICE’s decision making committees were aware of less than a quarter of all specific interests identified. For almost two thirds of the specific interests unknown to committees, disclosure by patient organisations was not required by NICE’s policy. The main strength of this study is the systematic and comprehensive search for relevant interests of patient organisations. Despite these efforts, incomplete and inconsistent reporting by both patient organisations and manufacturers means that uncertainty remains about the extent to which these results reflect the true prevalence of interests. Many organisations did not make specific details of pharmaceutical industry funding (including in-kind contributions) publicly available and did not provide these when contacted directly. Restricting the search to the two year period stipulated by NICE’s policy may also have led to under-identification of relevant interests. Although the Canadian Agency for Drugs and Technologies in Health and the Scottish Medicines Consortium also use a two year period for patient representatives, the French Haute Autorité de Santé requires declarations to cover the previous five years.10242526 Furthermore, a recent investigation found evidence of payments by manufacturers to FDA advisors up to eight years after their participation in drug advisory committees.27 A longer period of investigation, both before and after participation in HTA decisions, might have identified a greater number of relevant interests. Overall, however, the marked prevalence of interests gathered from a highly fragmented disclosure landscape indicates that this study provides a valid baseline assessment. Finally, we assumed that all written declarations of interest were available to NICE’s committees; however, if this was not the case, inconsistency between written and oral declarations means that committees may have been unaware of a greater proportion of interests than noted here. NICE has been a pioneer in patient involvement, and the extremely high contribution rate seen here is an indicator of the programme’s success.1216 Also, interests do not equate to a lack of independence of an organisation. Patient organisations provide much needed services for free in a difficult financial environment.31 Manufacturers represent important stakeholders for these organisations, not only for funding but also for advocacy on patient needs. When contributing to public policy, however, transparency about funding sources is critical to allow decision makers to make informed judgments about the relevance of any declared interests.3233 As Newton et al describe, organisations responsible for development and implementation of policy must institutionalise an approach to identify and manage perceived and actual conflicts of interest to maintain public confidence in decision making.33 NICE’s policy does this on an individual level, but it does not provide a standardised framework for interests held at an institutional level.20 We recommend extending this policy to include disclosure standards for patient organisations that contribute to NICE’s activities. These standards need to balance maintaining credibility in the objectivity of HTA decisions with overly restrictive measures that discourage patient organisations from participating in HTA. We recommend that patient organisations should be required to declare specific interests when contributing to individual appraisals. For example, the Scottish Medicines Consortium asks patient organisations to provide details of previous pharmaceutical industry funding that accompanies each of their contributions and is updated annually.34 Published appraisals include the proportion of income represented by pharmaceutical industry funding for each contributing patient organisation, including the manufacturer of the technology under appraisal.35 As NICE’s committees were less aware of funding from competitors than from manufacturers, these should be specifically asked about in declarations. Financial interests of committee members related to competitors have led to French legal rulings against decisions by the Haute Autorité de Santé in the past, so such “negative” conflicts of interest should be treated as seriously as more visible “positive” conflicts of interest.26 On consultation, patient organisations requested clear guidance with examples of relevant interests that should be declared to support consistency of disclosure. Any declared funding can then be recorded in the published guidance. NICE could also ask manufacturers to disclose any funding to patient organisations as part of committee meetings, using the same information as for Disclosure UK but providing an accessible record in the public minutes. Similar disclosure by manufacturers for all patient organisations has been a legal requirement at the Haute Autorité de Santé since 2010.12 As good practice, NICE could encourage contributing patient organisations to have a policy on pharmaceutical industry funding, ideally with a framework for policy/HTA activities. NICE should monitor this extended conflicts of interest policy and detail the consequences of non-compliance, which are absent from the current policy.20 We have shared these recommendations with NICE, which will review its policy in 2019. We thank all the patient organisations that took time to respond to our questions and provide feedback. We also thank Lizzie Thomas, Chloe Kastoryano, and Victoria Thomas of the Public Involvement Programme and Kevin Harris of the Interventional Procedures Programme, NICE, for their help in accessing data, understanding existing policy, and reviewing drafts of the paper. Contributors: KLM and HP designed the study. KLM, HP, RB, CS, and AP collected the data. KLM and KY did the analysis. KLM wrote the first draft of the manuscript. All authors reviewed the manuscript. All authors, external and internal, had full access to all of the data (including statistical reports and tables) in the study and can take responsibility for the integrity of the data and the accuracy of the data analysis. The corresponding author attests that all listed authors meet authorship criteria and that no others meeting the criteria have been omitted. KLM is the guarantor. Funding: No specific funding was received for this study. One author (HP) is an employee of NICE. Competing interests: All authors have completed the ICMJE uniform disclosure form at www.icmje.org/coi_disclosure.pdf (available on request from the corresponding author) and declare: HP is an employee of NICE, including during the conduct of this study; no other members of NICE had a role in the analysis of data; findings and drafts were shared with NICE to facilitate policy change, but the authors retained editorial control; HP is also the chair of trustees for a local branch of a national patient organisation Mind; Mind asks staff and trustees to adhere to their policy that restricts funding from pharmaceutical companies (full details of the policy can be found at https://www.mind.org.uk/workplace/corporate-partnerships/guidelines-for-corporate-partners/); KLM undertook a specialty training placement (but was not employed) at NICE before starting this work; no other support from any organisation for the submitted work; no financial relationships with any organisations that might have an interest in the submitted work in the previous three years; no other relationships or activities that could appear to have influenced the submitted work. Data sharing: A dataset of all publicly available data used in the study is available from the corresponding author at kate.mandeville@lshtm.ac.uk.
. Patient and consumer organisations at the European Medicines Agency: Financial disclosure and transparency. Health Action International, 2010.
, eds. Conflict of interest in medical research, education, and practice.National Academies Press, 2009. Health Technology Assessment International. Good practice examples of patient and public involvement in health technology assessment. 2015. https://htai.org/wp-content/uploads/2018/02/Good_Practice_Examples_Feb_2015.pdf. Health Technology Assessment International. Values and standards for patient involvement in HTA. 2014. https://htai.org/interest-groups/pcig/values-and-standards/.
. NICE Charter 2017. NICE, 2017. National Institute for Health and Care Excellence (NICE). Policy on declaring and managing interests for NICE advisory committees. Also includes witnesses, expert commentators and other contributors. 2018. https://www.nice.org.uk/Media/Default/About/Who-we-are/Policies-and-procedures/declaration-of-interests-policy.pdf. National Institute for Health and Care Excellence (NICE). Full list of all published technology appraisal guidance recommendations. 2017.https://www.nice.org.uk/about/what-we-do/our-programmes/nice-guidance/nice-technology-appraisal-guidance/summary-of-decisions. National Institute for Health and Care Excellence (NICE). Cancer Drugs Fund. 2018. https://www.nice.org.uk/about/what-we-do/our-programmes/nice-guidance/nice-technology-appraisal-guidance/cancer-drugs-fund.
. ABPI Code of Practice for the Pharmaceutical Industry 2016. Prescription Medicines Code of Practice Authority (PMCPA), 2016. Canadian Agency for Drugs and Technologies in Health (CADTH). CADTH Common Drug Review Patient Input. 2018 https://www.cadth.ca/about-cadth/what-we-do/products-services/cdr/patient-input.
. Patient Group Partners. 2018https://www.scottishmedicines.org.uk/about-us/public-involvement/patient-group-partners/.
. Hidden conflicts? Pharma payments to FDA advisers after drug approvals spark ethical concerns. Science2018;2018. doi:10.1126/science.aau6842.
. Nivolumab 10mg/mL concentrate for solution for infusion (Opdivo®). SMC No (1240/17).Scottish Medicines Consortium, 2017.
. The Sun Shines on Europe: Transparency of financial relationships in the healthcare sector. Health Action International, 2017.
. Rapport annuel du déontologue de la Haute Autorité de Santé (Article L.1451-4 du code de la santé publique).Saint-Denis-La Plaine Haute Autorité de Santé, 2018.
. Patient and public participation in commissioning health and care: Statutory guidance for CCGs and NHS England.NHS England, 2017.
. Managing conflicts of interest: Revised statutory guidance for CCGs 2017.NHS England, 2017.